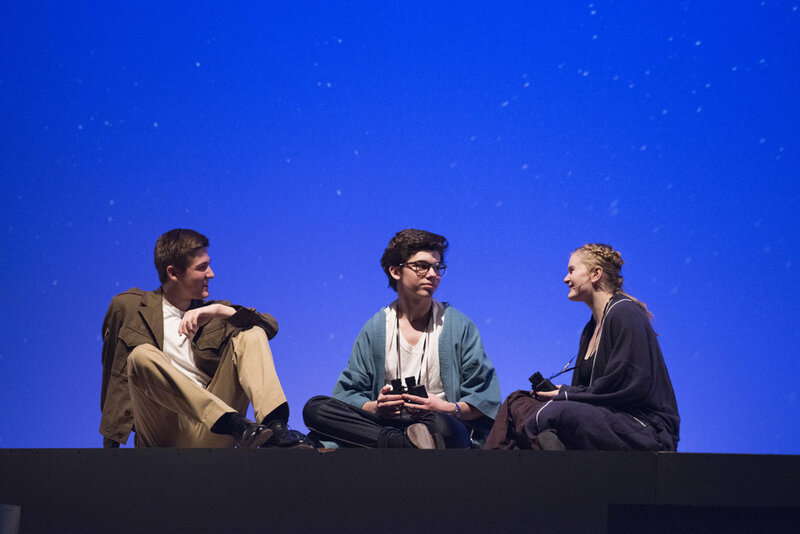 Sondheim’s controversial musical, Merrily We Roll Along, originally flopped on Broadway, but Durham Academy’s production had quite the opposite effect. The musical follows a reverse chronological tale that confronts the audience’s values of morality and friendship.With a talented cast, fantastic faculty leaders, a dedicated crew and a harmonious pit band, the show was a definite success. A series of catchy songs that left the audience humming for days introduced the audience to the lovable and fashionable character of Franklin Shepard, played by senior Yaakov Huba. Frank ponders on how he changed from a budding composer to a corporate film producer. Spectators took a trip down memory lane with Frank, his best friend Mary Flynn (played by senior Sarah Farrin) who is hopelessly in love with him, his other best friend and talented lyricist Charley Kringas (played by junior Carl May) and his ex-wife (played by junior Joanna Brooke). This is a production about musicians and their relationship with music. Therefore, the pit band, led by Upper School Music Director Michael Meyer, had an important role in accompanying the actors. The pit band musicians gained a new insight into the show by playing the music. Pianist Aram Lindroth, a junior, explained that the evolution of the recurring melody “Good Thing Going” adds a layer of depth to Frank’s character development. Senior Lydia Rockart ran the lights in the performance and explained that her favorite part was tech rehearsals. “For me, the best part of making the musical is also probably most people’s least favorite,” she said.